Shine a light on the road ahead while staying highly visible to motorists behind with the Exposure Flash & Flare Rechargeable Light Combo. The Flash and the Flare securely attach to your handlebar and seatpost, respectively, while also giving you a luminous torch for the dark roads ahead and a highly visible beacon approaching drivers on the road. 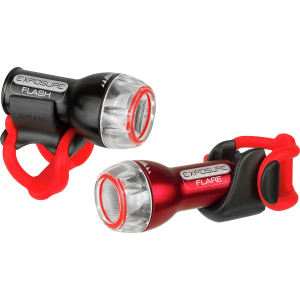 The Flash blasts a powerful 110 lumens to keep every twist and turn on your ride home illuminated, and the Flare switches between a pulsing and steady mode with just the twist of a dial to meet the needs of your commuting needs. And not to mention, the included CR123 batteries are rechargeable to keep your lights burning brightly from start to finish.